Digital Terrestrial and Mobile TVBut What About The Cost? The beginning of wisdom is to call things by their right names a Chinese proverb states. Indeed, when it comes down to a Digital Terrestrial or a Mobile TV deployment the money-question drops in eventually. A logical first reaction by broadcasters could be to request lower equipment prices to reduce the overall investment. Fair enough. But one might question whether such a short time measure could influence costs in the long run. Looking beyond the horizon items as operational issues, performance, maintenance, satellite bandwidth and quality pop up quickly, each single one of them nicely delivered with a price tag at the expense of the broadcaster. 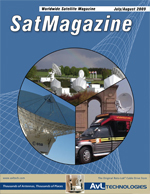 This article discusses the cost considerations a broadcaster could face during a deployment over satellite and explains how technologies as DVB-S2 Multistream and regionalization can reduce the total cost picture. Some use cases will be added to illustrate an alternative approach to design Digital Terrestrial or Mobile TV installations. A quick browse through the newspapers nowadays confronts us with topics on financial crisis, cost reductions, inflation levels, etcetera, a bit more than we actually would like to  we do not need to understand the root causes of the economic downturn to see that the market is reacting through major bank reorganizations, company restructuring, and governments adapting their budgets. As for the broadcast market, the financial resources obviously are not infinite. The economic slowdown may affect the media sector progressively due to the fact that financing new satellite projects could become more complicated resulting in less launches and a satellite bandwidth capacity reduction. Due to the reduced bandwidth over satellite it becomes increasingly important for new technology to get more bits per Hertz over the same bandwidth. On the other hand broadcasters and governments could choose to postpone new projects in order to optimize their current networks in a cost-effective way. Some long term projects might not be directly exposed to the current economic crisis due to the fact that they are bound to the regulatory environment and to government projects. One example is the analogue switch off in an increasing number of markets that needs to be in place before 2013 in Europe and North America. In times of financial crisis governments tend to start up large projects to stimulate internal economics and to ensure employment. Still there seems to be quite an interest in satellite business as the financial injection of 10 billion Euros from the EU towards ESA clearly illustrates. A first important consideration is quality. Broadcasters cannot afford to have downtime or to have bad picture quality because it will drive away annoyed customers (viewers) which could impact advertising revenues. Bad quality implies more service costs and more man hours to recover broken signals. As some DTT (Digital Terrestrial TV) and Mobile TV towers are located on remote sites service engineers need to drive up to these locations or extra investments in communication lines need to be made to enable multiple and fast remote management control. Another issue with low cost equipment is the tendency to replace internal parts during the product life cycle according to the market availability and price fluctuations as for example happens in the PC market where internal parts are changes every six months. As DTT and Mobile deployments mostly are planned over longer stretches of time a broadcaster could end up with equipment that has different internal parts at the end of the ride, increasing the difficulty of maintenance. Additionally it provides headaches in terms of spare parts supply after deployment. A final consideration is that low cost equipment tends to stick with old technology whereas new technology could bring features that have a big impact on other cost lines next to equipment cost. The switch for example from DVB-S equipment towards DVB-S2 already saves up 40 percent bandwidth, or 570k euros per year (market average) on a transponder. Price negotiations and comparison of different suppliers are natural steps in a purchasing process. This article is holding up a warning sign not to be blinded by short term price reductions but instead to look at long term impacts behind a purchase. What could be the Return-on-Investment behind acquiring new equipment? This aspect will be examined later in this article. Satellite links have the advantage not to depend on any telecom infrastructure on the ground and certainly are the fast track option to deploy a digital terrestrial TV network over entire countries. With the correct technology and equipment, satellite ensures a very economical way to perform the primary distribution of TV content. The operational costs do not increase with the number of towers and repeaters in the network, and last but not least, satellite also provides very efficient methods to synchronize and manage towers remotely. Cost of operation: new satellite network technology should investigate on how to put multiple services on the same carrier and how to save bandwidth over a satellite link. Cost of Content: new satellite network technology should protect the content of the satellite link in order to prevent piracy and (news) scoop hijacking. Nowadays, we see the transition from the DVB-S standard towards the DVB-S2 for the satellite links in the broadcasting market. DVB-S2 (Digital Video Broadcasting  Satellite  Second Generation) is an enhanced specification to replace the DVB-S standard. DVB-S2 is closely linked to the increased demand for High Definition Television (HDTV) over satellite. HDTV typically requires three times the bandwidth required for Standard Definition Television (SDTV) signals. From a cost perspective, DVB-S2 has a performance gain over DVB-S around 40 percent, or 570k euros, on a yearly basis (market average) on a transponder. Alternatively, up to 2.5dB less power is needed to transmit the same information in DVB-S2, which reduces the energy costs. Multistream is a main advantage in satellite communication for Primary Distribution of Digital Terrestrial TV and Mobile TV and is fully complaint with the DVB-S2 standard. Multistream, in short, allows users to aggregate (combine) a number of transport streams or IP streams into one satellite carrier in a fully transparent manner, maintaining the integrity of the original content. The application of Multistream within Primary Distribution of Digital Terrestrial and Mobile TV via satellite will be displayed in the following examples. The network examples have been simplified for clarity sake. In the first example (Figure 1), a DVB-T/H network with multiple carriers is displayed. Each ASI input stream (can be a multiplex) is modulated separately and send in different carriers over the satellite link. At the receiver end, separate devices (IRDs or demodulators) receive a selected carrier and send it through to the COFDM modulator in order to be amplified and transmitted to the end-users (mobile) TV set. Looking closer at the 36MHz transponder, five different carriers can be identified  four carriers for standard TV signals at 7.3MHz and one Mobile TV carrier at 3.6MHz. Due to the risk of inter-modulation (explained later), the satellite transponder cannot be saturated. When compared to the previous example, some interesting differences should be noted when building a Primary Distribution Network for Digital Terrestrial and Mobile TV over satellite with Multistream (Figure 2). First, the amount of equipment has been drastically reduced. The different ASI input streams coming from terrestrial and mobile TV bouquets are aggregated (combined) and injected into the modulator. At the receiver end, a multi ASI output satellite receiver is preferred above multiple single ASI output receiver devices (e.g., IRDs). Instead of 4 IRDs, a single satellite receiver unit with multiple ASI outputs does the trick. If we multiply this tower installation over a total deployment a drastic reduction in CAPEX can be achieved. In a network with 300 towers, only 300 satellite receivers (in this example) are required in stead of 1.200 IRDs. A second difference can be found in the transmission over satellite. Instead of sending different carriers over satellite, all the digital terrestrial and mobile TV bouquets or multiplexes are combined into one baseband stream before the modulator. A single carrier is sent over the satellite link towards the different towers. This Multistream operation allows saturation of the transponder. Additionally the compatibility with SFN operation is ensured through demodulating multiple transport streams from a single satellite carrier guaranteeing the integrity of the content. If we look at Multistream in a more technical sense (Figure 3), we see that transport streams (coming from encoders or multiplexers) and/or IP streams are divided into a chain of packets. The packets in transport streams and IP streams are encapsulated into Base Band Frames through stream aggregator equipment. These Base Band Frames consist of a header and a payload (content). Into the header the Input Stream Identifier (ISI)-value is inserted to restore the streams position at the receivers end. The header also bears the Modulation and Coding (MODCOD) information for each Base Band Frame. Multiple packets out of a similar initial transport stream can be stored in a Base Band Frame (16 or 64Kb). The Base Band Frames on their part will be multiplexed (combined) into a multiple input stream which is called the Multistream. The Multistream is injected into the modulator in order to be sent over the satellite link. At the receiver end of the satellite link the Multistream is demodulated. The Base Band Frames that are required for that specific location will be taken out of the Multistream and separated again into the different Transport & IP streams. The modulation and coding information are checked per base Band Frame. Once the transport streams are restored in their original ASI format, they can be inserted into the COFDM modulator and amplified in order to send through DTT and Mobile TV transmitter sites to the end-users (mobile) TV sets. As an additional benefit, Multistream is SFN-compliant, which is necessary for the distribution of digital terrestrial and mobile TV content in Single Frequency Network mode. Multistream in more human comprehensible terms could be described as multiple similar packets which are put into a box. Each box is labelled with a destination address, address of origin and how it should be sent. The resulting boxes containing different content are organized and put onto a means of transport that carries the payload from one location to another or to multiple locations. Arrived at destination the boxes are selected and unpacked. The packets are then put into their original state and in their original sequence. Multistream is fully in touch with the broadcasting operational reality as several services (Terrestrial TV, Mobile TV, Direct-to-Home and IP data distribution) can be combined onto one carrier. The combination facilitates the saturation of a transponder and thus achieves a more efficient and economic use of satellite bandwidth. Returning to the cost topic, Multistream can reduce the OPEX (bandwidth cost) by filling up a transponder to full capacity in a single carrier operation. Single carrier operation (Multistream) does not need the so-called back-off and can saturate the transponder to its maximum. The back-off is used in multi-carrier operations (one multiplex per carrier) in order to reduce the risk of shadows or inter-modulation between the different carriers which could compromise the quality of the received signal. Multi-carrier operations are not able to use the full output power of the transponder. When compared to (currently mostly used in the market) multi-carrier operation, Multistream saves up to 4dB resulting in more bits per Hertz of bandwidth (5 to 12 percent of bandwidth gain). To avoid jitter and time lapses in the television signals at the receivers end, DVB-S2 includes an Input Stream Synchronizer (ISSY) operation mode to be used with Multistream. Better implementations of Multistream do not require ISSY which is a big advantage as ISSY creates up to 2 percent overhead in the bandwidth. Analog TV broadcasting had to face the problem of co-channel interference, prohibiting the re-use of the same channel over considerable distances. In addition, echos (multi-path propagation) by buildings and natural obstacles resulted in receivers capturing the sum of the original signal, some delayed replicas and channel noise. To compensate this physical degradation, the traditional method was to increase the transmitting power, thereby increasing signal to noise ratio. Unfortunately, this also increases the frequency occupancy over a larger area as well as operational cost (power consumption). New digital transmission standards make use of the so-called SFN (Single Frequency Network) technique to overcome those problems. Under certain conditions, some positive echos in a COFDM broadcast can reinforce the original signal and the negative effect of other echos and/or channel noise can be bypassed. Single Frequency Network operation can be obtained only if all transmitters radiate the same digital signal at any point of the service area. Therefore, each transmitter within one SFN must radiate the same data bits, on the same frequency, at the same time. SFN requirements have a direct impact on the way to set up the transmitter network and the primary distribution network. Through Multistream equipment multiple transport streams can be demodulated from a single satellite carrier in a way that guarantees the integrity of the content in order to be compatible with SFN operation. In order to enable Multistream in DVB-S2, some adapted equipment is required. The use of the Stream Aggregator is a specific Newtec implementation. The content received from broadcasters is encoded in MPEG2 or MPEG4 streams. The different channels are inserted into the aggregator. The aggregator supports multiple ASI inputs and combines the different multiplexes in one baseband stream which is inserted into the modulator. In case of large number of ASI Transport Streams, other aggregators can be placed in parallel in order to feed the modulator. The cascading of several Aggregators yields to the creation of subgroups that can be routed to different modulators. The modulator sends the signal over satellite to the required locations. At the other end of the satellite link, the Satellite Receiver is capable of demodulating multiple MPEG streams in Multistream mode. The transport streams are separated again based on their DVB-S2 Input Stream Identifier (ISI). Another strong point  Multistream can be identified as a means to reduce the CAPEX. Instead of multiple Integrated Receiver-Decoders or IRDs (typically one IRD per carrier) in the transmitter towers, one unit can receive and distribute multiple streams over ASI and IP. This saving is multiplied by the number of towers where multiple multiplexes need be delivered for transmission. If we translate these findings into numbers, we see that for a deployment of 300 transmitter towers with 4 multiplexes, as much as 45percent can be saved in hardware cost through the use of Multistream receivers with multiple outputs. Combining multiple outputs in a receiver adds advantages that do not come to mind directly but which should equally be considered as they are delivered with a price tag at the end of the ride. If less units are used (i.e., 1 Multistream Satellite Receiver instead of 4 IRDs) the consumption of electricity will be lowered, the air-conditioning only needs to consider one receiver and the rack-size can be reduced to fit in space-limited cabinets. If we are in a cost saving mode, why not go all the way? By means of an example, the case for Multistream and regionalization will show that even more bandwidth can be saved on the transponder. The regionalization functionally, in short, allows the operator to distribute all 14 regional and nine national content undoubled on the same satellite carrier. The content of the terrestrial bouquets will be composed locally by the satellite receivers with regionalization functionality. In other words, the equipment inside the transmitter towers will pick the correct channels (nine national channels and one regional channel) out of the satellite signal that are linked to their region. The remainder of the regional channels are left disregarded. The content will then be transferred to the COFDM modulator to be amplified and transmitted to the (mobile) TV devices. Without this feature, each local bouquet would need to be composed centrally and distributed separately, increasing the satellite bandwidth cost dramatically. Multistream with regionalization does not jeopardize the quality of signal. The integrity of the content is guaranteed. If not the SFN operation requirement would not be valid anymore. In this real life example, nine national channels and 14 regional channels need to be distributed over satellite. In total, 280 Mbps content should be transferred simultaneously. Without considering Multistream or regionalization, three transponders would be required with a market average price of 2.5 Million euros per transponder per year. To avoid the multiple transmitting of national content in our example, some specific regionalization technology must be used on top of the Multistream keeping SFN requirements into scope. The big cost reduction using Multistream with Regionalization is realized through the requirement of only one transponder in stead of three to send the same information over satellite. In a whisker, a broadcaster saves 5 million euros on average per year. Additionally, some other services can be added to the transponder or rented to other parties as in this example the transponder capacity is not entirely filled. Return on Investment? On the fly. No matter how hard companies and governments try to secure their networks and content, the risk that unwanted parties intrude upon the network and/or abscond with vulnerable content remains high. Is security related to cost saving? Certainly. In the broadcaster market content is key and represents a big financial value in terms of revenue. If content is pirated or hijacked, the investment costs to recreate the stolen content will be harder to recover. Still, only a minority of the primary satellite distribution links are secured at this point. Two different security solutions emerge: BISS because it is standard compliant and AES because a simpler, yet more powerful, propriety scheme can support the high bitrates of DVB-T bouquets. With the financial crisis hitting hard and broadcasters in search for means to complete their Digital Terrestrial TV and Mobile TV networks projects, the exercise to find the correct technology and the correct equipment becomes an essential consideration in order to fit their restricted budgets. Broadcasters should look into reducing their initial investment as well as consider how the technology will affect their investments in the long term. The dimension beyond the price tag needs to be investigated closely. Certainly this is a priority, as broadcasters must consider new technologies such as HDTV and 3D television that are popping up above the horizon and they require additional transponder bandwidth over satellite. more precisely, best price solutions in the long term.